Knokke, the most exclusive seaside resort in Belgium, is a mere 100 kilometres (65 miles) from the capital of Europe - Brussels. With its broad and sandy beaches, its eight-kilometre (five-mile) seawall, a beautiful nature reserve and an enormous variety of options for relaxing, it is a true paradise. This sophisticated seaside town attracts visitors from all over the world. In the exclusive garden districts the architecture and surrounding natural scenery combine to form a harmonious whole. Knokke can rightfully call itself ‘the great garden on the North Sea’. The most representative villas in the Flemish country style as well as a scattering of English-inspired cottages are all protected monuments. Le Zoute’s urban landscape and architectural heritage are also listed in the Sint-Lukasarchief and various residences are designated as ‘to be preserved’. 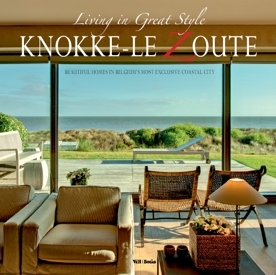 You will struggle to find as many brilliant interiors elsewhere as you can find in Knokke–Le Zoute! Magnificent homes lie secluded on the beautiful seawall, along serene little pathways and in stately lanes: from grand villas and charming apartments to cosy farmsteads. Knokke guarantees a wide range of styles - both traditional and contemporary, intimate and sparse and restrained and exuberant. Fabienne Vastapane has selected the most extraordinary of these interiors for this sublime photobook.